Where evil ruled and scarce was good. "Oooh they'd look good upon my shelf! I shall put them in a pot!" "Tehehee now you can't run far!" A spell was cast, and the folk turned small. And now they sit in jars, upon the shelf on her wall. 12th scale jars, with 1 or 2 figures in each - trapped by the wicked old witch! 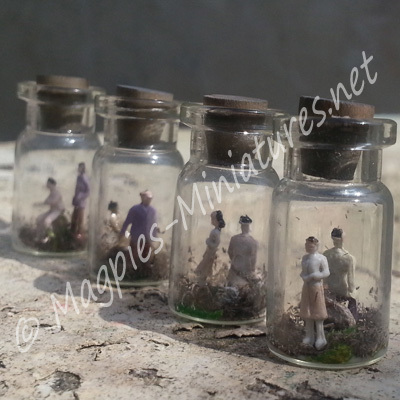 Perfect for Doll House miniature scenes, but also could be used as necklaces or tiny ornament. Each jar is 25mm tall, approximately. The lids have not been secured on, incase you wish to use these for jewellery. Made by Magpies-Miniatures, and are exclusive to us- we don't supply our handmade goods to any other retailer. Figures may vary from those shown- and colours most definately do vary.